Viper green. Say it again, slowly and with a bit more finesse. It sounds like something you’d associate with a high performance track weapon, right? Wrong. 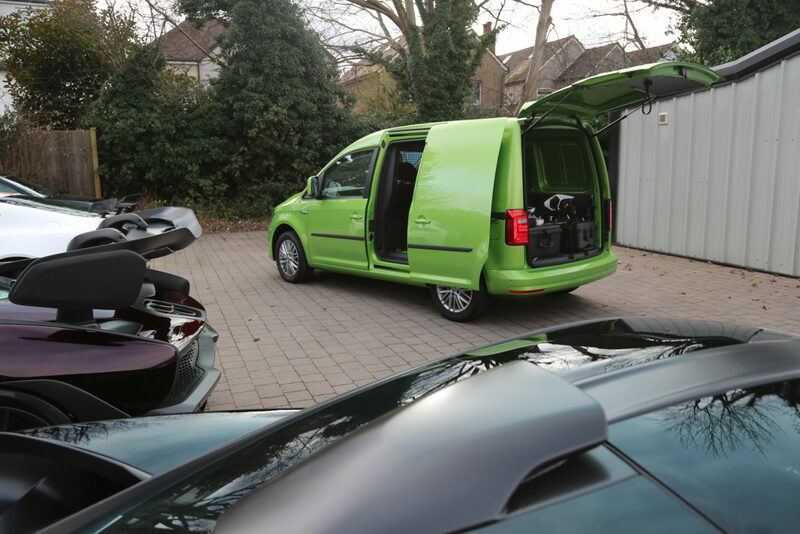 In this instance, it relates to our newest addition to the fleet, the Volkswagen Caddy. It’s the first thing I want to talk about, as for this humble (ish) Caddy there’s no question that it’s the first thing you’ll notice when you see it. It’s a colour that has split opinion among anyone and everyone who has seen it out on the road so far, but personally, after a month with it, I’ve grown to like it and actually think it’s a great colour for a van of this type. Sure, it’s a colour that would sit nicely on a loud-and-proud supercar or a vehicle with lots of toys – like a camper van, for example – but that comes with the image of owning those types of vehicle. They’re all about being seen and in-your-face. You don’t often see a smaller, mid-range box van in a bold metallic colour like this and there’s something charming about that. KY68 ADV doesn’t shout and scream, it doesn’t hurl you around racetracks or have a host of bells and whistles – it just gets the job done. If you combine that traditional Caddy ethos with this colour, it has the ability to put a little smile on your face every time you get in it, in a way that a standard silver or white example just wouldn’t. While it doesn’t necessarily have a lot of features, there are some nice touches to bring it right up to date. This van has VW’s Park Assist feature, which is a great option for those who want a little help parking the van. We tried it out and it carried out the process without any hiccups at all, although it did choose a space for a bay parking manoeuvre that left us very little room to get out. I’m still not one hundred per cent sold on it being fitted to a van in the same way I would be if it was fitted to a city car, but I can see how this would be useful for many people parking around tight industrial locations. 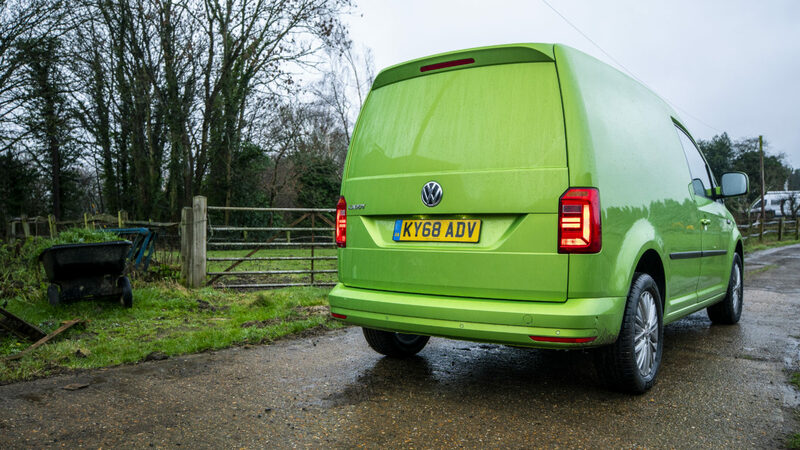 The interior lighting throughout the van has been refreshed with white LED bulbs which compliment the green very nicely. They are super bright too which makes it incredibly easy to see inside the van at night, particularly when unloading all of the camera gear in the rain at this dark and dingy time of year. It’s this little touch that for me, brings the long-lasting Caddy platform up to date. 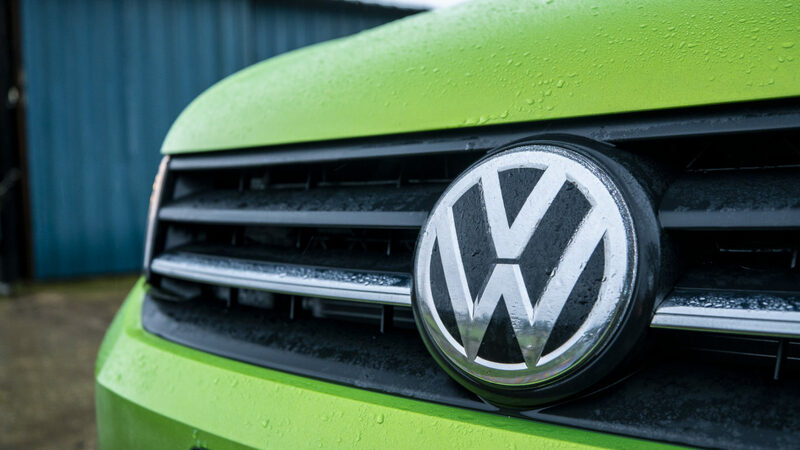 The infotainment system however, doesn’t offer a lot to complain about – housing Bluetooth connectivity, satellite navigation and DAB radio – but it is becoming quite dated if you are familiar with any of Volkswagen’s domestic vehicles. It’s a good system, and all functions work as they should, it just feels as though it’s starting to be overtaken by some of the competition. How does it drive? Well, a few years back I ran a 2004 VW Touran for a while with a similar powertrain set up to this Caddy. It was a front wheel drive turbocharged diesel with a manual ‘box & it’s power output nudged to around 100bhp. The MK3 Caddys of that era shared a lot of their mechanicals with that Touran, and KY68 ADV doesn’t feel like it’s come on leaps and bounds since. It’s fitted with Volkswagen’s latest 102PS 2.0 turbocharged diesel, paired with a five-speed manual gearbox, of which VW claim will produce a combined fuel economy figure of 60.1mpg. In the last few weeks we’ve seen on average high 40s to low 50s, which is a little off the mark but still very good. 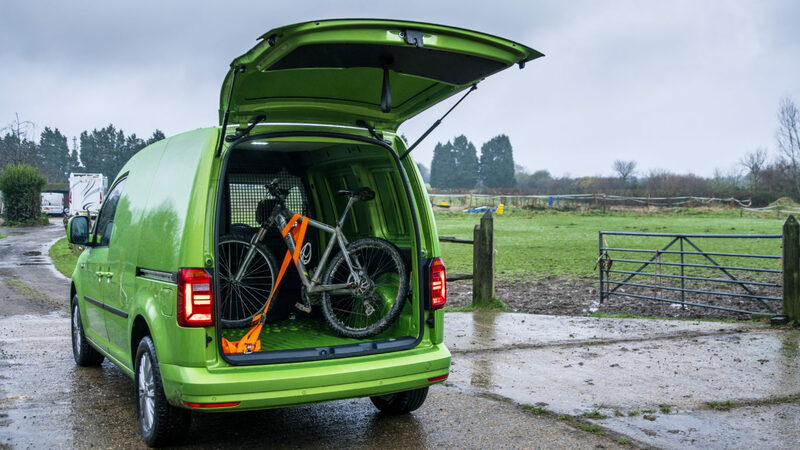 It’s a tried-and-tested formula that Volkswagen have presented for a long time now and it packs enough grunt to get you up to speed – with or without a full load area – reasonably good handling and a comfortable ride. It doesn’t blow you away, but then it doesn’t really need to. It does feel as though the Caddy is getting a touch long in the tooth, but then again ‘if it ain’t broke don’t fix it’ springs to mind. Moving on to some of the real-world testing for this van now, and it’s performed perfectly at it’s primary use. January has been a busy month for us and we’ve not really given it a chance to ease it into it’s life. You could definitely say it’s gone straight from the factory and into the fire. It’s first major midweek outing was a journey to a high profile performance and luxury car dealership, and that meant it needed to carry all of our camera equipment, drones included. Of course, this wasn’t a problem and with the conveniently placed anchor points, we tied everything down so nothing was thrown around in the back, saving damage to both the equipment and the load area. The nature of the Caddy’s size was exceptionally useful here too. It’s not a big, cumbersome vehicle that you have to take that extra minute or two trying to park. It didn’t need any extra thought when navigating around thousands of pounds worth of supercars, either. Find the gap. Drive through it. Park it up. Use it as a work station. This seemed to be the recurring motto for the day, and without any issues. Weekend adventures saw the Caddy collecting a mountain bike, taking part in a few tip runs and an airport adventure – all of which were a breeze. Again, the anchor points came in very handy on all these trips. The bike didn’t warrant any parts being dismantled before it was loaded, I walked the whole thing in and strapped it down without any problems; luggage was free from sliding around, as were the final bits of debris from a recent house move. Over time, I think there’ll be a lot of really important outings for this van, and more-than-likely some exciting ones to report. HIGHLIGHT OF THE MONTH: Meeting a fellow Caddy owner who expressed their mutual love for the colour.